Carl Peters was one of America’s successful and intriguing artists, a master landscapist and genre painter within the realist tradition, represented in his time by the American Scene and regionalist movements. Peters also executed a series of murals under government sponsorship during the Depression era. Some critics have said that his drawings that were executed on the front lines in war-torn France in 1917-18 rival those of John Singer Sargent. For his urban and rural snow scenes, Peters was the winner of three Hallgarten Prizes at the National Academy of Design. He also won numerous other prizes throughout his career, including the first ever Fairchild Award in Rochester (1924). He exhibited his works regularly at the National Academy, the Pennsylvania Academy of the Fine Arts, the Corcoran Gallery, the Art Institute of Chicago, the Syracuse Museum of Fine Arts, the Fort Worth Museum, the Rockport Art Association and the Memorial Art Gallery of the University of Rochester. Carl Peters’s formative years were spent in the city of Rochester but as a young teenager, he moved with his family to a farm near Fairport. Peters realized his talents at an early age, and devoted every day of his life to becoming a professional artist (he had already declared himself an artist in 1917). When America joined World War I, Peters became a soldier and was sent to France where he worked as a camouflage artist. After the war, he returned to Rochester with vivid front-line sketches and even a few paintings. Besides sketching and painting every day, and acquiring the fundamentals of art education in Rochester, Peters continued his training in New York City. He enrolled in the Art Students League in New York in the fall of 1919. Soon Peters took advantage of the League’s summer school program in Woodstock, where he was exposed to more progressive ideas, including the “Ash Can” philosophy of Robert Henri; both Henri, whom Peters heard in Woodstock in the summer of 1921, and George Bellows deeply influenced him. At Woodstock, Peters came into contact with the dynamic “Rock City rebels,” including Andrew Dasburg, Henry Lee McFee and Konrad Cramer, who were developing what became known as a “rural cubism.” Peters would slowly assimilate some of these influences as well as elements of Cézannesque formalism, by now (1920) widely accepted, into his own style. At the A.S.L., Peters studied outdoor landscape painting initially under Charles Rosen (summer of 1921), who at that time was vacillating towards modernism, then under John F. Carlson (summers of 1922 to 1924), who became another important mentor. 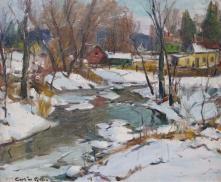 While winning impressive awards from art institutions, Peters established a painting routine, spending the winters in Geneseeland, painting both urban and rural snow scenes, and the summers in the active artists colony on Cape Ann, Massachusetts, where he encountered Aldro T. Hibbard’s milieu. As soon as Peters began to exhibit his works, in 1923, critics sensed something spiritual in his art; the Rochester art community realized that an impressive and genuine young artist had entered the scene. Away from home, Peters became a member of the Rockport Realist circle of Hibbard, William Lester Stevens, and Maurice Compris. Then at the dawn of the Great Depression, Peters executed a huge, impressive mural, which showed his outstanding talents as a large-scale artist, far surpassing the demands of easel painting. Here he applied his expert knowledge of academic figure painting, integrating a complex design into an architectural setting. Peters would receive more commissions for murals until 1942, when the heyday for public art had passed, and the styles of European modernists, which puzzled most viewers, especially in cities like Rochester, took precedence. During the Depression years, Peters struggled, as did most artists, but he found comfort in his art, turning toward a more colorful bravura, simplifying form and exploiting color as never before. Peters was given one-man shows in his native Rochester, several times, and toward the end of his life, the Rochester Art Club honored him with a special ceremony. Works by Peters may be found at the National Museum of American Art, part of the Smithsonian Institution, in the Memorial Art Gallery of the University of Rochester, and in various private collections. Love, Richard H. Carl W. Peters: American Scene Painter from Rochester to Rockport. Rochester, NY: University of Rochester Press, 1999.